EKO - Funky Disco Music. Vinyl LP. Bleep. 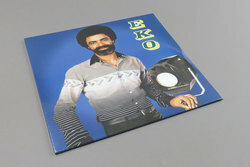 Killer full album reissue from the folks at Africa Seven, this turn turning their attention to Cameroonian musician Eko Roosevelt Louis and his 1978 album Funky Disco Music. Don’t let the title deceive you though, as this album has it all. Uplifting disco hits for sure, but sweet jazz funk and fuzzy rock tracks to boot. What the entire thing does have is a sun-soaked, upbeat atmosphere that’ll help see these approaching spring months in right. Ultimate late night party jam ‘Bowa’a Mba Ngebe’ is our pick of the bunch though.